Isla del Sol means Island of the Sun and this island has plenty of sunshine and so much more. 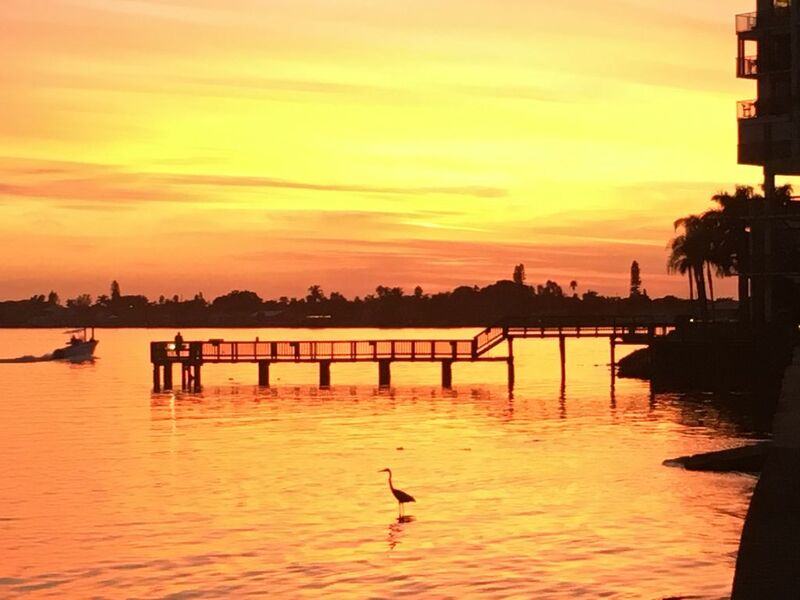 It is a private island with beautiful landscape, peacefulness, and gorgeous views of Boca Ciega Bay! The beautifully appointed unit is WATERFRONT with regular sightings of dolphins, manatees and various Floridian birds. It is a corner unit, with views in 2 different directions from the master bedroom, living room, dining area and screened porch. Enjoy the waterfront screened porch, newly-tiled floors, 2 full-bathrooms, 2 comfortable bedrooms, and gorgeous views from the dining area. The master bedroom has a king bed and the guest room has a trundle bed, which can be used as 2 separate twin beds or one large queen bed. There is wireless internet access, cable television, DVD player and 2 televisions. The unit is within steps of the bay, swimming pool, hot tub and a covered, reserved parking space. You will want for nothing when staying at Bahia del Mar on the tranquil island of Isla del Sol. SUNRISES AND SETSETS ON THE INTERCOASTAL!!! THIS IS UNDOUBTEDLY THE BEST CONDO MY HUSBAND AND I EVER RENTED. THE CONDO IS CLEAN, COMFORTABLE AND TASTEFULLY DECORATED. THE VIEW FROM THE LANAI IS AWESOME; SUNRISE AND SUNSETS, DOLPHINS AND TROPICAL BIRDS ARE ALL A WELCOME SIGHT!! IT IS ALSO A GREAT LOCATION TO THE BEACHES AT FORT DE SOTA, PASS A GRILLE AND ST. PETE'S BEACH AND MANY GOOD RESTAURANTS. TARA IS WONDERFUL AND ALWAYS RESPONDED PROMPTLY TO MY QUESTIONS. WE WOULD DEFINATELY RECOMMEND THIS CONDO. Thank you Tara for sharing your beautiful place with my family. It has all you need and more. Perfectly located, close to St. Pete Beach, pass-a-grille, De Soto park. We really enjoyed our stay with our two kids. Thank you, Jovan. I am so glad that you and your family enjoyed your stay. My husband and I just stayed a week at the condo and loved it. It was very quiet and had everything you would want. Would definitely stay again. Our condo association requires an application and fee when renting. I will forward the application to you and you only need to fill it in and submit it along with a $90 payment, directly to the Association. Thank you. Please let me know if you have any questions.